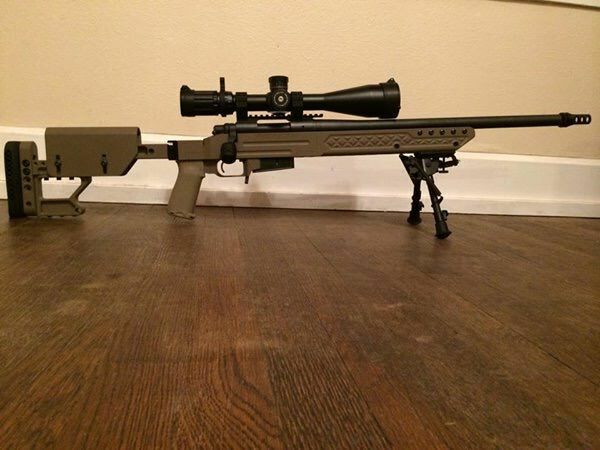 For sale is a lightly used Remington 700 AAC-SD in .308, in a FDE Mcree precision chassis, timney 517 trigger, surefire MB762 brake, seekins 20 MOA base and rings, and a SWFA 5-20 HD. All in all ran me $3000, would like to get $2050 for the whole package. Two of the pics have the old muzzle brake on it, and the newest pic is a group pic with the surefire installed. Must sell as action+chassis combo. Please PM me for details. Thank you! How much for just the rifle? And the scope and rings? Can you send me pics? They aren't showing up for me.